Me: Do you want a coke? I mostly now call that drink “soda” with the occasional relapse to the “generic” coke. It’s the same for the fridge, which every once in a while gets called an “ice box.” And that gets me the seriously weird “Are you from 1895? !” look. A similar conversation goes down once a week, on burger night. Minimalist. And we’re almost to the point where we can communicate via eyebrow signals and tongue clicks. We name our burgers based on the toppings. Because it’s fun. And because it quickly sums up exactly what we’re having for dinner when my husband has 3.27 seconds between meetings to check in via text message or IM. The names might be as obvious as The Italian (mozzarella, basil, oven-roasted tomatoes, and pesto mayo) or The Fajita (avocado, grilled onions and peppers) or maybe it’s something a little less obvious to others like The Texican. The Texican is one of our very, very favorite burgers. It pairs awesomelywith a classic lime margarita (my beverage of choice) or an ice cold [whatever we have on tap in the garage] (my husband’s beverage of choice). 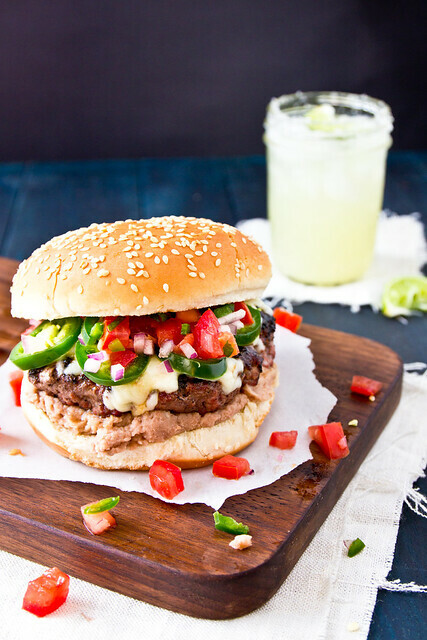 It starts with either a fluffy white bun or a Jalapeno Cheddar Bun, and then a flurry of Tex Mex staples like shredded Monterrey jack, Pico de Gallo, refried beans, chipotle ranch dressing, and all the fresh jalapeno slices a person can stand. 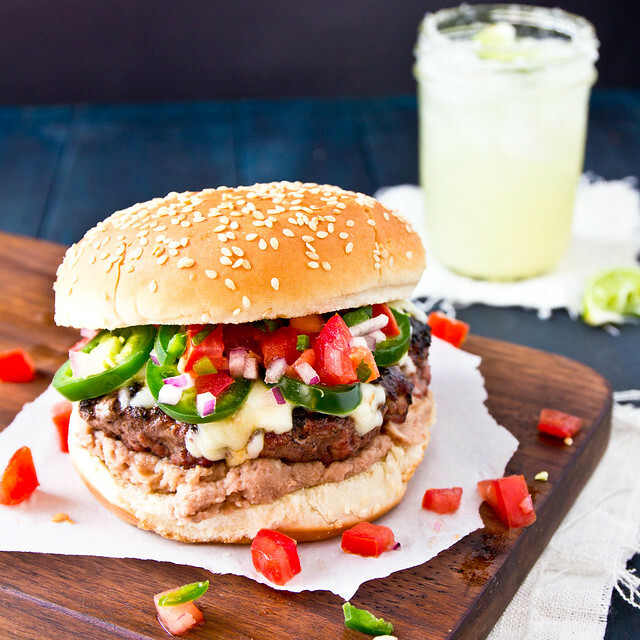 A juicy Tex Mex-inspired burger with refried beans, Monterrey Jack, chipotle ranch dressing, and pico de gallo. To make the pico de gallo, stir together all the ingredients in a bowl and set aside. Each side of the patties should get a dash of Worcestershire and a pinch of salt and pepper. Cook the patties to desired doneness. Before removing them from the grill, top each with ~2 Tbsp of grated cheese and let cook 1 minute more to melt the cheese. 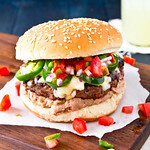 To assemble the burger, spread ~2 Tbsp refried beans on to the bottom bun, top with the cooked burger, fresh jalapeno slices, and a generous scoop of pico. Serve with margaritas or beer, alongside chips and a bowl of your favorite salsa. This loaded burger sounds to die for! Awesome! And it cracks me up what people call soda in various areas of the country… all coke, soda or cola. oh my goodnes..you had me at the name.. then the picture. The recipe was just the icing on the cake..this sounds amazing! We are totally going to love this in my house! Ooh, I cannot wait to make these for my husband when he comes home! He’ll love them! That is the most perfect picture of a burger. Ever. Those are some awesome burgers! I’m seriously coming to live at your house so I can eat fun burgers, drink margaritas and enjoy the garden/citrus trees in your yard. No problem, right? I need this. Now. Incredibly, incredibly good! Yum!!! I’m a Texan now living in NYC and I miss the bean burgers from Chris Madrids sooooo much. Will be making these this week. Thank you! Would it be weird, do you think, if I made a bean burger and topped it with refried beans? Overkill? But I just LOOOVVEE the sound of these toppings so much! Looks awesome! Everything about it sounds good! Especially, paired with a margarita! Dang, that thing looks more delicious every time I look at it. I LOVE jalepenos on my burger. I want one right now!! Now that is one nice looking burger! Thank you for sharing this recipe! I made these tonight and they were AMAZING! These will be added to the rotation for sure.